Manuel Pellegrini is a happy man, claiming his Manchester City side are ‘getting better’ as the season progresses – indicating that he believes they are in the hunt for the quadruple. Winning 17 of their last 20 games is a record that makes them favourites for the Premier League title, even more so now that top scorer Sergio Aguero is back fit and firing. Coming off the bench, Aguero scored one and made another as City beat Cardiff 4-2. ‘I think we are getting better. 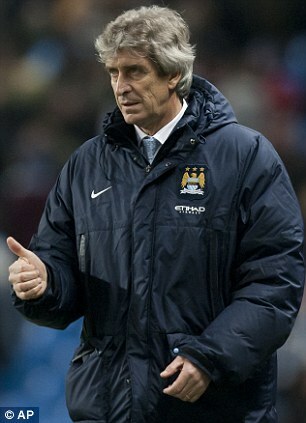 At the beginning of the season it isn’t easy to change so many things,’ Pellegrini said. Aguero found the net on his return against Blackburn on Wednesday, and asked whether he was surprised the Argentine has carried on where he left off, Pellegrini said: ‘No. I see him working every day. City looked like they would romp home to yet another comfortable three points at the Etihad after a blistering start but were made to work by Ole Gunnar Solskjaer’s side. Craig Noone had equalised for the visitors after Edin Dzeko’s opener – which was given thanks to the Goal Decision System – but Pellegrini’s side went ahead soon after thanks to Jesus Navas. Yaya Toure and then Aguero added gloss before a set-piece defensive lapse by Martin Demichelis allowed Fraizer Campbell a consolation. That mistake from the central defender is something the boss shouldn’t be overly pleased about, but he refused to assemble blame and looked relatively nonplussed about the defensive performance. ‘Maybe the second goal [I’m disappointed about],’ he said. ‘It’s always better to concentrate, but Cardiff didn’t have many chances. It’s not my first worry. They scored their 103rd goal of the season in all competitions, with 63 in the league, and look breathtaking on every occasion they venture forward. Chelsea’s record of 103 is one that is in serious danger now. 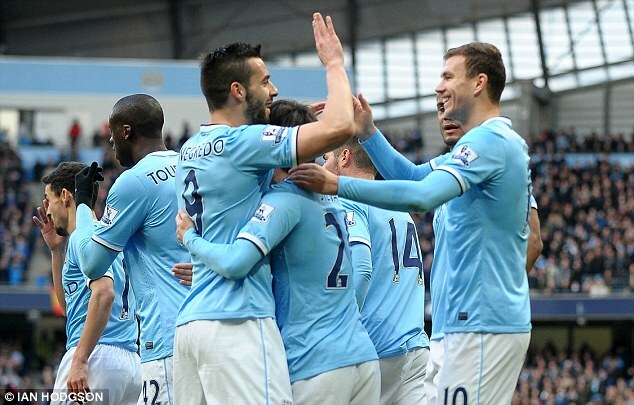 ‘It’s not easy to score that many goals,’ Pellegrini added. ‘It reflects what we think of the team. We are always a creative team. For Solskjaer, it is time to reflect on an afternoon where they really could have nicked something. But now bottom of the division for the first time, they need results and quickly. ‘I knew what I was up against when I came here,’ the manager, who takes his team to Old Trafford next up, said. ‘I didn’t come here thinking it was going to be all singing, all dancing. It is a tight league. ‘We felt that with 15 minutes to go the crowd weren’t sure of the three points. We made them make mistakes. The start was disappointing.